If the books No More Dirty Looks and Eat Pretty had a baby in 2015, it would likely be named Skin Cleanse and read like a whip-smart older sister who knows just how to get you to pay attention and finally use all those raw natural beauty ingredients you’ve been hoarding. I had the pleasure of finishing up S.W. Basics (formerly Sprout Skincare) founder Adina Grigore’s first book, Skin Cleanse, this week, and came away inspired to continue to pare down my beauty products (kinda hard when you’re a product reviewer) and learn just what simple beauty ingredients work best for my skin. While reading Skin Cleanse, I easily drew comparisons to the two books mentioned above because of the emphasis Adina put on the crucial things we’ve learned from both NMDL and EP: The beauty industry’s lack of regulation doesn’t help us much, and we need to clean up our diets if we want our faces to be clean and clear, too. But the way in which Adina outlines these concepts feels fresh. While most of us probably consider ourselves “deeper green” beauty babes than perhaps the “lighter green” target of this book, I still found myself feeling sheepish at the things Adina calls out in Skin Cleanse and inspired by the challenges and ideas she presents. But don’t get me wrong. Adina doesn’t come at natural beauty skin cleansing with a shame-angle (shame-gle?). Instead, she points out what everyone else won’t say because they’re likely 1) selling you something or 2) clueless. See where I get the “big sister who’s telling you like it is” motif? In addition to the often-recommended suggestion of keeping a food journal to identify items that may be triggering reactions on your skin or in your body (and to open your eyes to everything you’re actually consuming), Adina also recommends keeping a skincare product journal to get an accurate picture of everything you’re putting on your body in a day. Even for us green beauty junkies, the list is overwhelming. (Remember this post?) It’s a bit embarrassing to see how many lotions, oils, creams, serums, cleansers, wipes — the list goes on — we use to attempt to maintain great skin. It’s also a bit maddening to know that despite using all these magic potions (natural or not! ), most of us are still left with something to desire in our skin. This is where Skin Cleanse — and the actual skin cleanse process — gets really good. Adina reveals three levels of skin cleansing that you try in an effort to reset your skin’s dependency on a billion products and slowly add in only the good, simple skincare that your skin may be craving. Though I consider myself a “deeper green” beauty who gets the ins and outs of products, ingredients and labels, the levels presented more so take into account your deep dependencies on products — natch or not. This is what got me. I may have the most clean, beautiful skincare collection you’ve ever dreamed of … but I only have one face, and there’s no way I need 17 face cleansers and 32 face oils to get the simple job of cleansing, hydrating and protecting done. I took a stab at Level 2, which involved detoxing my skin by going sans makeup and sans products for just one day. One day, and my anxiety levels crept up so high. What’s a product junkie to do? 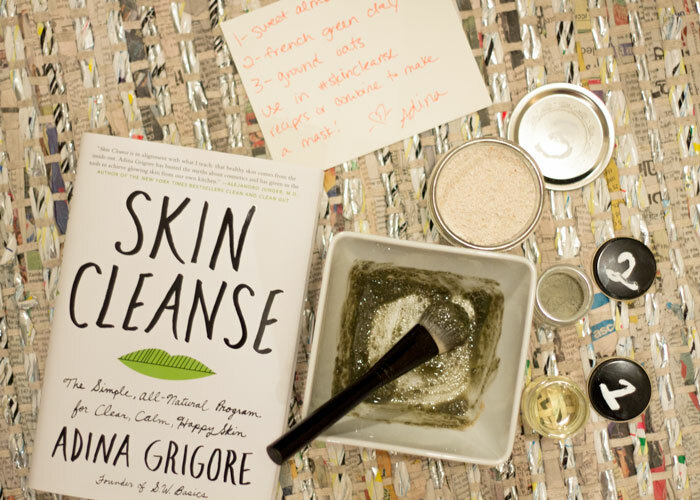 Well, for one, whip up some of the fun DIY skincare recipes Adina provides in the book. And for two, well, spend time doing other stuff that doesn’t take as long as my 10-step green beauty blogger regimen. Did I miss some of my favorite green beauty products? Yes. Did I fully embrace the “less is more” approach and enjoy becoming re-introduced to the happy, glowing skin that I’ve been bad-mouthing off and on for years? Yes. Am I getting excited to finish out a lot of my products and use more pared-down, simple ingredients like shea butter and aloe vera going forward? Yes. While I’ve always stocked some favorite carrier oils and items like apple cider vinegar and honey in my skincare arsenal, Skin Cleanse reminds me to actually use these things and not get carried away by the latest, greatest facial oil (which likely uses my favorite carrier oil, jojoba, in some fashion) or toner (which likely has a base of apple cider vinegar) that I could probably whip up myself. That’s not to say that absolutely everything can be DIY’ed, nor do I have the desire to go completely DIY in my skincare, but instead it’s a reminder to not overthink some things in my skincare philosophy. Do I really need a fancy oil cleanser? Nope, just use your favorite carrier oil. Do I really need a crazy cream to keep my skin hydrated all winter? Nope, shea butter is probably just fine. This book helps me re-confirm where I want to spend my money and my time in my skincare regimen, and it also gives a gentle wake-up call that the beauty industry (yes, even our precious green beauty industry) is still driven by sales. Use what makes you feel good. Don’t follow all the hype. It doesn’t have to be an entire collection of expensive, fancy products. It doesn’t have to be an entire collection of every organic skincare ingredient in the bulk bins at Whole Foods. Instead, like with fashion, the best skincare collection is a mix of your favorite high- and low-end pieces that work with your skin’s personal style. You define the high, and you define the low. Your skin will tell you what it needs. It’s your job to listen to it. I would also suggest listening to what Adina preaches in Skin Cleanse. You don’t have to make big changes all at once, but even us “deeper green” and “medium green” beauties could use some reminders when it comes to how we’re approaching our skincare. I’m thankful to have Skin Cleanse on my bookshelf, right next to Eat Pretty and No More Dirty Looks, for when I need a few gentle reminders (and some skin cleansing inspiration!). Have you checked out Skin Cleanse yet? What are your green beauty addictions? What’s your take on DIY? What are some of your staples? Tell me everything in the comments section!